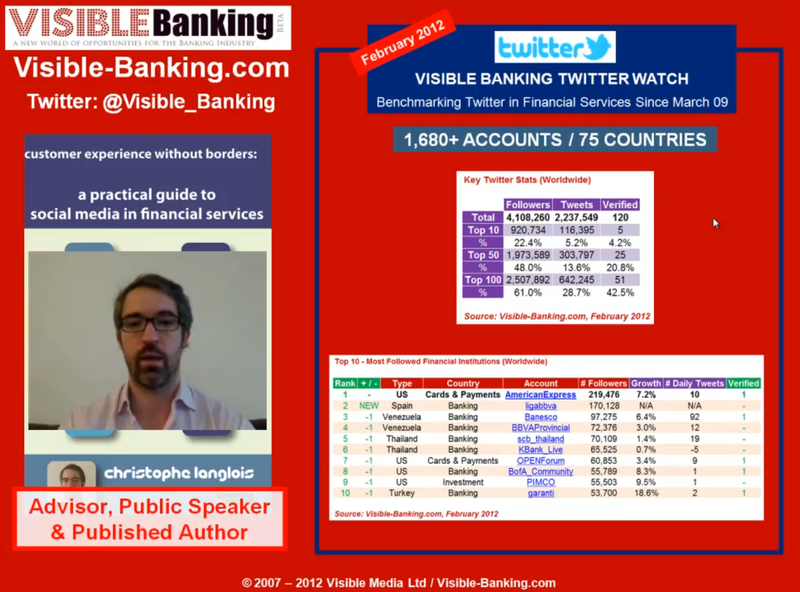 This is my latest video update on our popular Visible Banking Twitter Watch series, the most comprehensive benchmark of the worldwide financial services industry on twitter. My team are now tracking over 1,680 accounts in 75 countries. I invite you to watch my video where I talk you through our latest aggregated figures from the industry (data from the 1st February 2012) and the global Top 10 most followed financial institutions on twitter. Financial institutions mentioned: American Express (US), Banesco (Venezuela), Bank of America (US), BBVA (Spain, Venezuela), Garanti Bank (Turkey), Kasikornbank (Thailand), PIMCO (US), SCB (Thailand). Other companies and groups mentioned: NBA, New York Times, Lady Gaga.